September 11, 2015 @ 9:00 pm - 11:30 pm at Thoughtfaucet. Made by Robots will be doing a special performance at Burlington’s largest festival of creativity: The Art Hop. The scene will be insane. Plan to bike or walk. Or come a day ahead and camp out. Seriously, it’s ground zero for Art Hop. 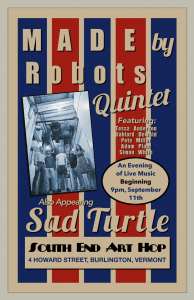 And we’re excited to be doing the show with our friends Sad Turtle. It’ll be a “no vocals, just music” kind of scene at Thoughtfaucet studios. If you’ve never been to Thoughtfaucet: Enter at the loading dock on Howard Street and follow the green stripe on the wall.